on February 14, 2019, 11:22 a.m.
One in five (21%) Malaysians have faced discrimination based on their ethnicity when renting properties, new research from YouGov shows. The study shows that Malaysian Indians are particularly affected, with slightly less than half (46%) saying they have faced discrimination. This is notably higher than the proportions of ethnic Chinese (20%) and Malays (18%) who say the same. YouGov’s research finds that a third (34%) of Malaysians are currently staying in rented property. Seven in ten (69%) have rented property at some point in their lives. Six in ten (62%) have come across rental advertisements with racial requirements (such as only a certain race, or a select few, being eligible to apply) at some point. While a third (35%) of Malaysians overall know someone who has faced ethnic discrimination when renting, this number jumps to six in ten (63%) amongst Malaysian Indians. Of those who have an opinion, two in five (37%) Malaysians think stating a racial preference in property ads constitutes racism, with ethnic Indians in particular believing this (58%). However, three in ten (32%) of the population as a whole believe that landlords renting to preferred races makes good business sense, a view most likely to be held by Malaysian Chinese (39%). The research finds that six in ten (60%) think that landlords should have absolute discretion when it comes to renting property. The piece of background information they think should be compulsory is gender (65%), closely followed by nationality (64%), marital status (63%), occupation (62%). 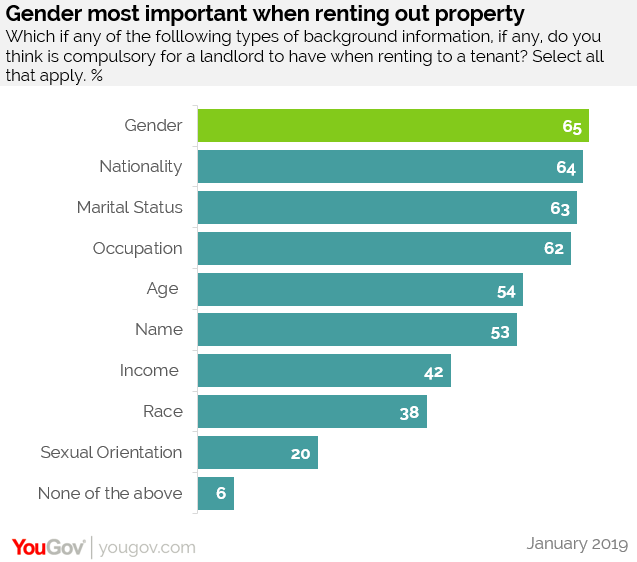 Almost four in ten (38%) believe it should be compulsory for landlords to know the race of a tenant.